Thanks to Bob and Mary, I knew a lot about this hillside neighborhood. Plenty. That’s no surprise to you, I’m sure. Anybody who lives close to the ocean knows this. And it’s understandable to property owners not close to the ocean. As you know, in talking prices and what affects them, realtors say that Number 1 is location, location, location. But of course there are good, better, and best views. How much of a dollar difference is there between these? Well, let me give you a fairly good idea of such values in my new hometown, Morro Bay, Calif. I’m using one hillside neighborhood as an example. But I don’t think you’d be far wrong in using these to gauge other neighborhoods like this up and down the coast. Take a close look at this photo I took. I selected this neighborhood because I know a couple who live about three-fifths of the way up. For privacy’s sake I’ll call them John and Mary. They’ve lived here for years so I took their price estimates as reliable. 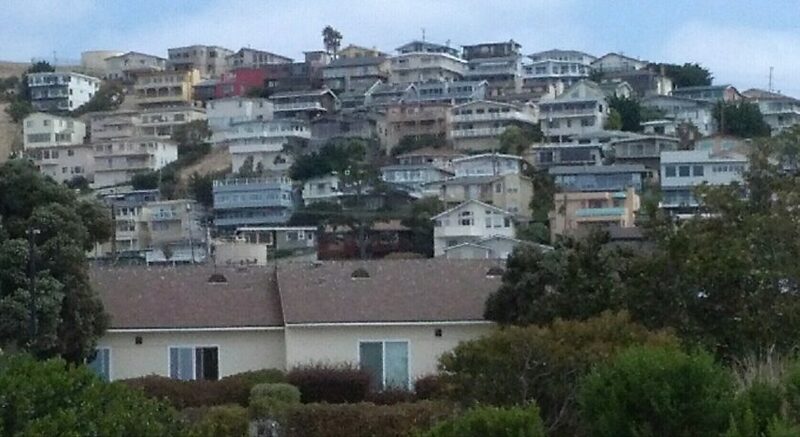 Important for you to know there are 11 horizontal streets on that hillside, like rungs on a ladder. About four of them at the bottom are blocked from view by the buildings in the foreground. As you climb, the prices jump up because of the better view. And of course, some increase more also because the homes are bigger. Size is the second biggest factor. Well, the ones at the bottom go for about $500,000. Those halfway up about $750,000. And the ones at the top for $1,000,000 plus. It was pure good luck for me to pick a neighborhood where good, better, and best views were so neatly separated. Caution, now. These are average prices. Some properties in each category could be lower or higher. Notice also that the higher you go, the closer together they’re packed. At the top, some are elbow to elbow. In a couple, if the folks in one of them find they’re out of coffee, they can just call their neighbor, who will promptly come to the window and reach out hand them some. See how all of them have large picture windows and full-width balconies? Of course. They all want to max their ocean views. That’s why they bought up there. The only reason some didn’t buy higher is because their pocketbook couldn’t swing it. Of course, the taxes to the city keep pace, and dramatically. The taxes way up at the top are thousands of dollars more than at the bottom. Now here’s a remarkable thing. I couldn’t make out anybody out there on those big wide decks and looking out. Maybe some inside were gazing out through their picture windows. But I doubt it. Why? Well, judging by what I’ve seen at Bob and Mary’s. After a while, the thrill of those Oh! and Ah! views peter out. They take the great views for granted. Nevertheless, imagine my surprise one day when Bob mentioned that the views are so important that he’d consider raising his house four or five feet. Whatever the city zoning regulations would permit. Because he does enjoy looking out. Plus, he feels the jump in the value of their house would make the decision a smart one. I didn’t see anything on the water. No boat big or small. No spouting whale, I couldn’t make out any birds. The sea was so tranquil that it was boring. But above I saw the blue sky. The big white cumulus cloud being wafted gently by the wind. Gorgeous. The sun’s bright rays poking through. Moving as they were, the clouds were really worth looking at. I accept that. No argument. Truth is, I enjoy looking out at the Pacific now and then. I live a mile or so from it. On a flat part of town. Zero view of the water. But I have a couple of favorite ocean look-outs. I drive to them once in a while. One is up the road to the top of the huge hill above the Morro Bay golf course. No houses up there. Just Mother Nature in all her greenery. With the great canopy of the shifting sky above. And a gorgeous view of our harbor, and of the Rock at its entrance, and the enormous flat ocean beyond it. Truly a sensational view. The Rock, I must tell you, juts out of the sea like the great burnt out volcano that it is. Huge. A famous landmark along the California Coast. The early explorers all made note of it in their journals. A foolproof landmark for navigators. A sacred place for the native people. Hey, the Rock has even been called the Gibraltar of the Pacific! Who knows what interesting things I might get to see when I take a ride up there. Sometimes there are boats, big and small, entering and leaving the harbor. Our harbor is interesting. Handsome yachts. Big commercial fishing boats. You can’t see those up over by Bob and Mary’s. Notice that I said now and then. If I lived way up there 24 / 7 above the golf course, I’m sure the view would lose its pizazz. I get a bigger kick out of spending 20 minutes up there on an occasional visit than I think I would living up by Bob and Mary’s. I live a mile from the ocean. Can’t see it from my place, which is on a plateau. But I have a nice view too, but so different. I step out on my little porch and what a pleasure to see my neat little lawn with its flowers and bushes and interesting rocks and the two tall palms towering high. And my neighbors’ places, all interesting in their own ways. And I can use my trike. I’ve mentioned my wonderful tricycle before. I use it to do my errands. Get exercise. For the simple fun of pedaling it. I use it more than my car. My trike up on that great big hill whose picture I showed you? No way! I hope that a big energy crunch never comes. A serious gasoline shortage, for instance. Those folks living way up there would be in quite a fix. I hope Bob and Mary won’t take offense. It’s just an honest difference of opinion.